Another of our favorites from this wedding. We had great light to work with, but we use that great light a lot differently than most. 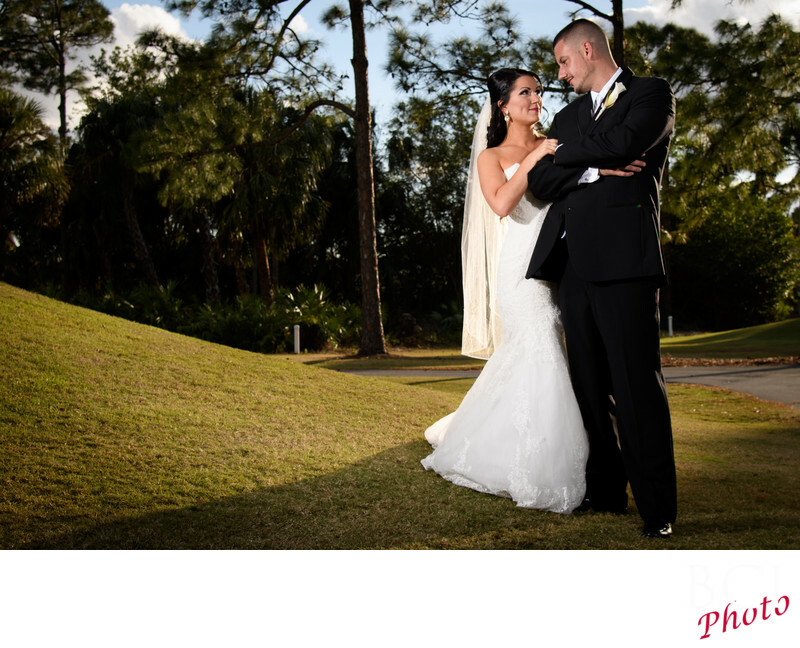 As in this shot, the sun is behind them creating a fabulous rim light and dramatic shadows for a wonderful affect, while we provided the light on bride and groom with our dynamic professional portrait lighting that we use every wedding on location. This really sets us apart. Rather than having blown out skies with no details in the background, by lighting our subjects up to match the existing light, we capture a much more natural looking scene than is possible using the marginal techniques most companies are able to bring to the event. Our goal is not to deliver an image that looks lit...but rather to deliver images that look just like the human eye saw the scene. The only way to accomplish that is to augment the existing light therby bringing the exposure levels of the subject to match the existing skies behind them.